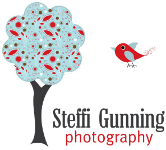 Steffi has been happily capturing memories for First Coast families professionally for over 10 years. Her love for the camera and for the beauty of one's soul to shine through shows in her art. Her approach is a causal and relaxed one so that the session will not only be successful but enjoyable too. Although she has a cozy studio available, she prefers natural light because people have a tendency to seem a little stiff in the studio and kids don't like sitting still in one spot....it's much easier to just chase them around! Steffi doesn't just capture the portrait, but she meticulously adds her own artistic touch to it in her post processing creative editing. This talent separates her from most photographers. Steffi Gunning Photography....cherished portraits with a casual southern style.